sukhi urad dal recipe - homely and delicious punjabi recipe of dry urad dal which makes for an excellent protein rich dish with rotis or phulkas. rinse 1 cup urad dal a few times in water. then soak urad dal in enough water for 4 hours. 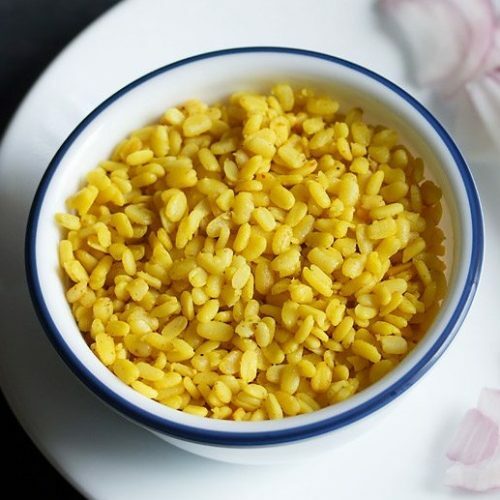 soaking urad dal is very important in this recipe. otherwise while cooking the urad dal if not soaked, can get mushy and pasty. after 4 hours, drain all the water. rinse the urad dal very well in fresh water. drain and keep the urad dal aside. heat 2 tablespoons oil in a 2 litre pressure cooker. keep the flame to a low and then add 1 pinch of asafoetida. mix well. do make sure that the asafoetida does not get burnt. next add the urad dal. mix well. now add ½ tsp turmeric powder, 1 or 2 green chilies (chopped or slit) and ⅛ teaspoon red chili powder. mix again very well. season with salt. add ¼ cup water. mix again. pressure cook the urad dal on a low to medium-low flame or sim for about 7 minutes or 2 whistles. once the pressure settles down, open the lid and check the urad dal. the urad dal should be cooked well and yet separate. if the urad dal is not cooked, then add some more water and pressure cook for 1 whistle more. add ¼ teaspoon garam masala powder. mix again. serve sukhi urad dal with rotis or phulkas. garnish with some coriander leaves. also do squeeze some lemon juice on top while having dry urad dal. soaking is important, so that the urad dal cooks well and remains separate. soaking the urad dal also reduces the cooking time. please use a 2 litre pressure cooker only as a larger size cooker won't work well. you can add less or more spices and green chilies as per your requirements.